Where do I use my Gardening Direct voucher code? At Gardening Direct you’ll find a variety of gardening products including bedding plants, perennials, shrubs, trees, roses, bulbs, tubers, corms, fruit, vegetables, seeds, pre-planted products, gifts and accessories. 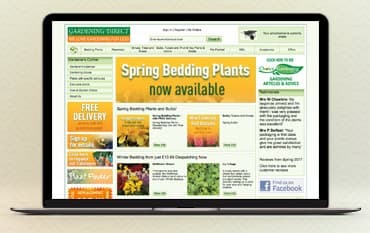 You can shop by type, season, combination and event to find the perfect products for your garden. Whether you’re looking for small plug plants, basket flowers, climbing roses, tulips, daffodils, chilli peppers, containers, troughs, flower bouquets for special occasions, fertilisers, outdoor living products or anything else, you can find it all for affordable prices at Gardening Direct. As well as all this you can find a great special offers section on Gardening Direct where there’s tons of deals and discounts available. You can also discover a gardeners calendar, gardening advice, plants with specific attributes, exclusive plants and ‘how to’ garden videos. You can also request a catalogue to browse through at home or use the plant finder to find specific plants with all the attributes you want. If you know a fellow gardening enthusiast you could always surprise them with a Gardening Direct gift voucher of up to £20 so they can find all the gardening supplies and accessories they want for themselves. Gardening Direct have a ‘choice gardening club’ where you’ll find all manner of comprehensive references for gardeners of all levels. This club aims to be an invaluable resource for both amateur gardeners and horticulturists. With over 1000 articles that are updated regularly, you are sure to find great tips and advice to help with your gardening. Find information on growing fruit, aspects, lawn care, sowing vegetable seeds, water lilies and laying patios as well as loads more useful help. There are tons of gardening accessories available at Gardening Direct to help make your garden look amazing. Everything you could need for your garden can be found in the accessories section, from hanging baskets, to flat pack planters to compost, you can find all the products you need to keep your plants well fed all summer long. Gardening Direct will help you to achieve your perfect garden as quickly as possible with minimum effort with things like fertiliser, planting kits and bird care feed. There’s also a huge array of outdoor cooking products, perfect for BBQs and garden parties in the summer. In the offers section, you’ll find a variety of gardening products including plants, bulbs and compost for greatly discounted prices. This section is great if you’re shopping on a budget, and as it’s updated regularly, you can keep checking back for brand new products with different price reductions. Browse by popularity, price or by A-Z to find your ideal garden products and use one of our voucher codes at the checkout to grab even more savings on your items. Gardening Direct offer free delivery on everything. Should you not be entirely satisfied with the goods from Gardening Direct please notify them within 30 days of receipt and they will provide you with a replacement or refund. Gardening Direct has been supplying customers with a huge range of products since it’s launch in 1996. Over the years the brand has rapidly become a leading mail order supplier of young live plants, now with over 1 million customers who have been delighted by genuine convenience, low prices, value for money and consistently high-quality plants. New, different and unusual plant varieties are continuously added to the Gardening Direct range, which also includes garden hardware and accessories. Shop online with a Gardening Direct voucher code and you can enjoy great savings on all your plants and accessories, you can also benefit from free delivery and tons of great deals in the offers section.